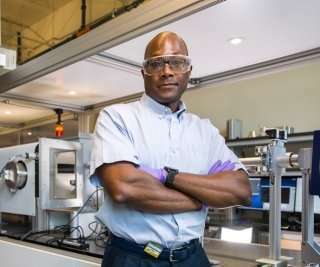 "All of these challenges came from batteries that have safety and stability issues when the goal is to push performance," said Epps, an expert in designing and fabricating conducting membranes useful in energy generation and storage devices. One way to overcome this challenge in the lithium-ion batteries for the above devices is to improve the battery membranes—and the associated electrolytes—that are designed to shuttle the lithium ions, which offset the electrical charge associated with charging and discharging the battery. At UD, Epps' team has patented an idea to improve battery performance by introducing tapers into the polymer membrane electrolytes that allow the lithium ions inside the battery to travel back and forth faster. It all starts with polymers, which are materials made of small molecules strung together like beads on a necklace to create a long chain. By chemically connecting two or more polymer chains with different properties, engineers can create block polymers that capitalize on the salient features from both materials. For example, polystyrene in a Styrofoam cup is relatively hard and brittle, while polyisoprene (tapped from a rubber tree) is viscous and molasses-like. When those two polymers are linked chemically, engineers can create materials for everyday items like car tires and rubber bands—materials that hold their shape but are impact resistant and stretchable. Years later, in work at UD, Epps' group took the idea a step further and realized they could tune the nanoscale (1/1,000th the width of a human hair) structure of these polymers to imbue materials with certain mechanical, thermal and conductivity properties. Manipulating the taper also allowed the researchers to control the nanoscale structures that can be formed by the block polymers. By incorporating the tapers, Epps' team can create nanoscale networks that make the battery materials more conductive—introducing nanoscale highways and eliminating traffic bottlenecks, allowing ions to move at higher speeds and making the polymer more efficient in battery applications. "Technically, we want to conduct ions faster … this approach in polymers would allow us to get more power out of the batteries. It would enable the batteries to charge faster, in a manner that is also safer. We are not there yet, but that is the goal," said Epps, who patented the concept through UD's Office of Economic Innovation and Partnerships. He calls this work a "designer approach" to polymer science. In laboratory experiments, Ketkar and others in the Epps group have shown that introducing a tapered region between polymer electrolyte chains actually increased the overall ionic conductivity over a range of temperatures. At room temperature, for example, the tapered materials are twice as conductive as their non-tapered counterparts. But that is not all. The taper improves the material's ability to be processed, too. 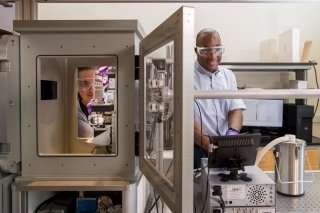 "Previous methods for increasing conductivity have either made the polymer harder to process or used greater amounts of chemical solvent, which makes the material more flammable and less environmentally friendly," Ketkar said. "That is why I am really excited about this new approach." "The only way this works is if all of the components are flexible, including the battery and power units, not just the case, screen or buttons," Epps said. "This aspect is where block polymers become really ideal because—like a rubber band that remembers its shape despite stretching, bending and other manipulation—with polymers, you can make the internal components more impact resistant and shock absorbing, which will improve the phone's lifespan." "What if there was a sensor inside the football that was designed to alert officials when a player crosses a specific yardage, say for a first down," Epps said. "You would not need to rely on an official's on-field view of the play or instant replay." "You would need something that will not break or leak, so using a polymer that has the material properties of say, a rubber band, that also can conduct ions like a battery would be a perfect solution," Epps said. "This avenue is one direction in which you could imagine these materials blossoming."